Custom BBb Martin Wilk. Removable valve section and lead pipe. Vented MAV valves. Has two tuning slides. One is a regular one and the other is a reverse tuning slide. Comes with a gigbag as well. Asking $4,500. Located in Huntington, WV. Also, it just needs polished up where it is in raw brass. Great playing and open in all registers. I know most people say their horn is great and then try to become that salesman but this horn plays. The reason for selling the horn is because in have two BBb's. I'm in the process of trying to get the pictures to load and or dropbox linking them. I'm not tech savvy. I believe I got the dropbox set up. Last edited by mwlorrison893 on Wed Aug 29, 2018 11:56 am, edited 7 times in total. Wow, what a beautiful instrument! 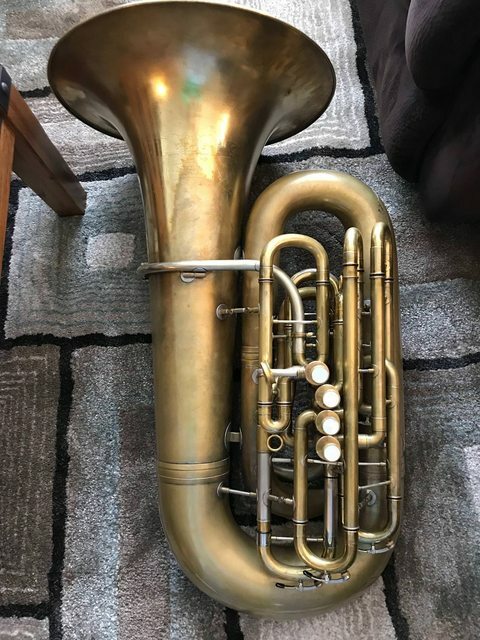 Martin's work is fantastic and if I were in the market for a B-flat horn I'd be making an offer. I don't know the buyer but I would bet some coin this is a brilliant player - and looks pretty great, too. Good luck to the seller! What is a reversable tuning slide? The bell is a Conn. Is the rest of the horn a Conn as well with MAW slides? Reversible tuning slide is the same as what you see sometimes on a trumpet. Instead of the tuning sliding going in tubing, it goes over tubing. Believed to help with the flow of air from what I've been told. Yes, the bell is an old Conn Eb Monster bell and the rest of the horn is from unknown. I believe the valve cluster appear to be something comparable to B&S but not 100% sure on that. 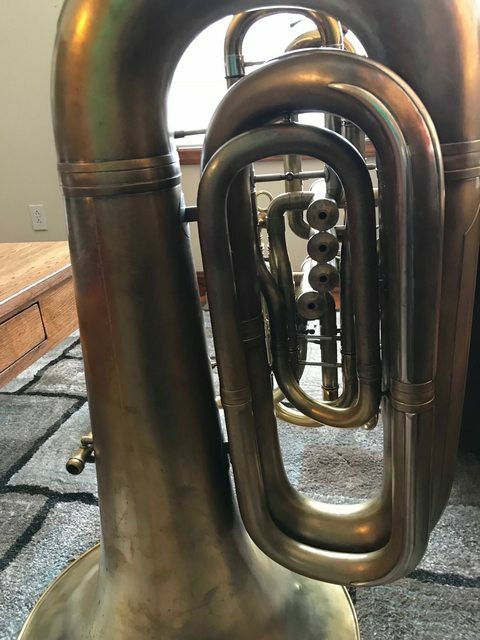 This is an awesome 5/4 tuba! With a great voice. Martin Wilk built it for me and unfortunately hard times forced me to sell it a few years back. It was pristine, dent and scratch free at that time. The bell and branches are all from a 1915 US Navy commissioned BBb horn. It is not a Monster Eb, it is too tall and the diameter at the first ferrule is much larger than a Monster Eb or similar modern King 2341. Martin actually had sent me photos of King 2341 tubes compared to the Conn. In every instance the Conn branches were bigger and the King tube end fit inside of the corresponding Conn tube end. And if memory serves me correctly, the bell is 20-1/2 inches wide. It was originally a top-action upright tuba, but Martin rearranged the wrap and made it a front-action for me. The valve section is Meinl Weston 'large vales' The same as on all of their large tubas. With the MAW custom valves. The valve slides are all custom configured, straight as an arrow and work wonderfully. One of the main tuning slides is traditional, with both legs fitting inside the matching tubes from the valve section. 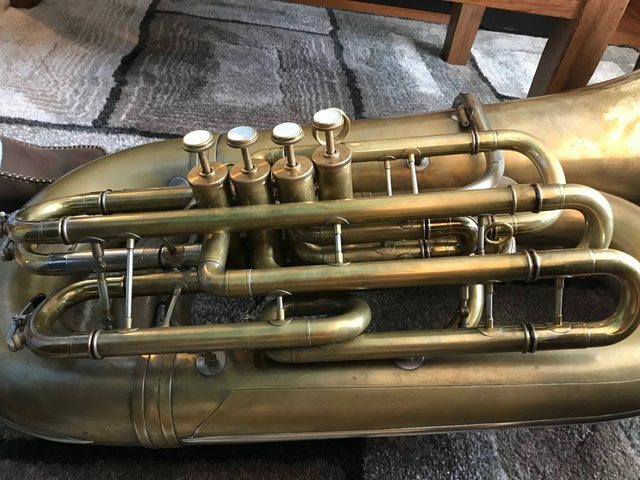 The other tuning slide has the thinner leg fitting over the corresponding tube from the valve body, so one leg is outside-fit, the other is inside-fit. As mentioned, this is similar to many trumpets on the market. It provides a different blowing experience and coloration of tone. Attempting to describe the difference does not do the horn justice. 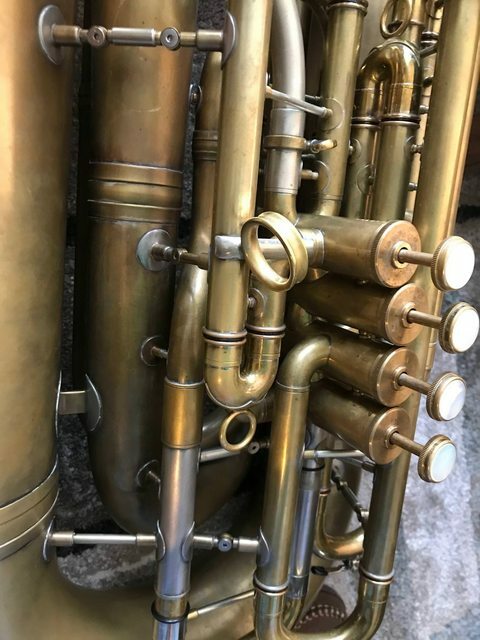 This chassis, the bell and main branches, tubing taper are identical to the vaunted "Donatelli" Conn tuba that surfaces here every few years. Yes, I actually measured them side by side, when that horn was at Dillon's. The funny thing is that the bell on the "Donatelli" horn is from a top action tuba, because of the location of the seam. Or maybe Conn, at the time, only produced the tuba bells one way and that is how it went. 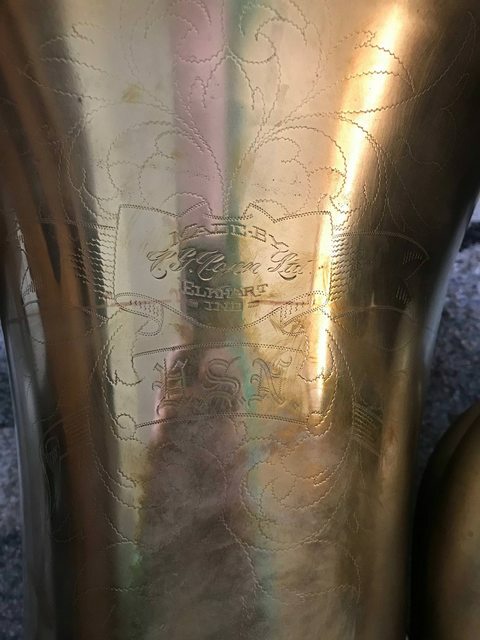 The seam on this horn runs up the back, opposite the engraving, as you can see in the last photo. Please do NOT polish this horn. The finish is a "Scotch Brite" scratch finish everywhere except the bell engraving. You would be investing way too much effort to try to actually polish the horn. You might try a liquid wash on/wash off type of product to brighten it up, but trying to make it smooth and shiney will remove too much metal. The inside of the bell is smooth with no Scotch-Brite finish. All of the reinforcing rings at the ends of the slide tubes are bronze, so they will have a different color. The valve section and lead pipe connecting hardware is Conn/King and easily disconnected using an allen wrench. You will not go wrong with this horn. Well, thank you David. That answers questions I had regarding the size of the horn. Looks like a real sweet horn. Is the MAW/Conn still available? Gorgeous horn. 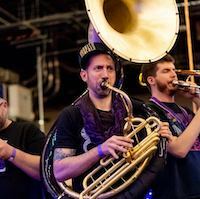 This might sound like a strange question but would it be possible to get picture of this horn being held while seated in the playing position? Also, maybe next to another horn? I am trying to gauge actual size and determine if this would work for me or not. Sorry for the inconvenience. I second what Michael said. This is a gorgeous instrument. I would love to understand its ergonomics and scale a little better. Coming to Huntington isn't out of the question for me either. This isn't an issue I will get to that in the morning or afternoon. I'll get a picture of it beside my Gnagey and Conn 25J. (4/4, 5/4, and 6/4) I work nights so I typically don't get online here until once I'm at work. I'll send you a message once I do. Ltrain wrote: I second what Michael said. This is a gorgeous instrument. I would love to understand its ergonomics and scale a little better. You're welcome to Huntington, WV at time! Have a mini jam out session on the porch or somewhere. Bring a whole new meaning to the words “Thundering Herd”. Or would that be Thundering Heard. Michael Grant wrote: You're welcome to Huntington, WV at time! Needs to go due to my twin daughters being involved in competitive dance studios now and well, that stuff is expensive! Haha. How's that photo coming along?